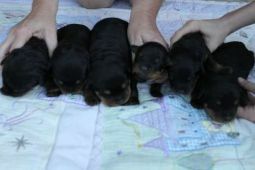 Rottweiler breeders links and breed information on pups4sale.com.au. pups4sale testimonial: I just want to say thank you for your wonderful website. All of my puppies have sold and 90% of them were sold through your site. I will definitely be using you again. 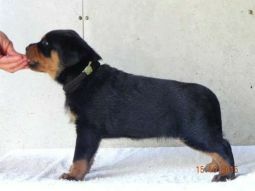 The Rottweiler is a solidly built dog that is known for its great strength and intelligence. Although known in many parts of the world as an aggressive animal, that reputation is unearned because it was bad owners that got the worst out of the breed. In reality, Rottweilers are calm and obedient when trained properly and they make great family pets. 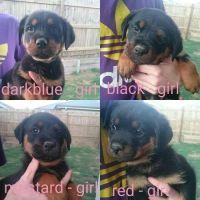 Thanks to Janice Nieass for the pictures of Rottweiler puppies & adults used on this page, and the additional information provided. Rottweilers are generally known as one of the most beautiful dogs in existence. They're evenly-colored, have beautiful coats, and have an attractive, alert look. Most of them have cropped tails, but that is slowly going out of fashion now that the breed is used less and less as a work dog. 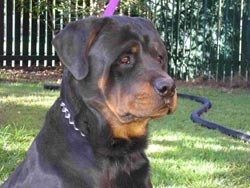 The jaw of the Rottweiler is what really sets it apart from other dog breeds. Pit Bulls are often talked about because of their strong jaws, but Rottweilers have by far the strongest jaws of all and are popular for them. Their jaws are very strong because they have big, square heads and a lot of power. It's also easy to point out a Rottweiler because of their unique coat. Most of their body is black, including their lips, but they have brown eyebrows and a brown patch or two on their body and head. It really is unfortunate that Rottweilers are known for being mean dogs because they really aren't by nature. The only way they become aggressive is if they were taught to be that way, which is definitely what should not happen with any breed. In reality, a well-trained Rottweiler is about as smart and as sweet as they come, which many owners around the world can attest to. In reality, Rottweilers are smart, loyal animals that will do absolutely anything for their owners. They will play all day long if they're allowed to and cozy up at night with anyone willing. They are man's best friend to the maximum because their favorite place to be is by their owner's side. People who are planning on owning a Rottweiler should do plenty of research on the specific bloodline of the dog they might get. Rottweilers are known for being improperly bred, so some quirks that are very tough to train out of them. Rottweiler puppies should be taught early on how to act properly. Otherwise, they can become very destructive and they'll quickly have the strength to destroy larger pieces of furniture. This doesn't mean they can't be goofballs, but they need to be told when they are being a little too crazy when they are puppies. Rottweilers are great with children, though smaller kids should be careful when a young Rottweiler gets excited. A well-trained Rottweiler will play with everyone in the family until they are completely zapped of their energy. If they learn at an early age how to act around other dogs, they are actually quite playful even as adults when other dogs come around. Their aggressiveness only comes out if they feel that another animal is threatening their owners. Since the Rottweiler is an incredibly loyal dog that knows its own strength, it makes an excellent watch dog. It has no fear if it knows that its owners could potentially be harmed, so it will both bite and attack anything it sees as an intruder. It's important that they learn how to control this instinct around strangers, though. 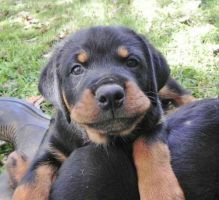 Rottweilers do love to be around their families, but most adults can be left alone and not wreck havoc on their homes. Of course, Rottweilers that haven't had their regular dose of walks and other activities will potentially use their powerful jaws on things around the house out of frustration. If they're happy pets, they're okay by themselves for small periods of time. Training is extremely important when dealing with Rottweilers because they can become anxious and aggressive if they don't learn how to control themselves. While this may sound worrisome to anyone who might want to own a Rottweiler someday, the fact is that all it takes is dedication to your dog and a strong grasp of training fundamentals to end up with a happy and healthy Rottweiler. Rottweilers are a bit stubborn early on in the training process, which is why it is not a breed that is recommended for first-time dog owners. They naturally think that they are in charge from the time they are puppies, so owners have to work with them slowly until they understand who is boss. It can take some time to get through to them, but it is very rewarding when you see your Rottweiler finally comprehending what you are telling it to do. Rottweilers become amazing dogs when they are trained early on in their lives both by themselves and with other animals. They will learn to listen and will follow all of the rules of the house if the person who trained it knows what he or she is doing. Rottweilers don't need a lot of exercise to be content, but they do need to live in a home where they can move around without feeling crowded by furniture, walls, and people. They need between 1 and 2 hours of rigorous exercise every day to keep in shape and to work off all of their energy. The only time a Rottweiler shouldn't get too much exercise is when it is very hot outside. They have dark fur to go along with their large size, so the sun will affect them more harshly than other dogs. Rottweilers may have shorter coats, but they are double coats so they are going to need to be brushed often to keep hair from getting all over the place. A brushing once every week will keep their coats in nice shape and will keep their living spaces nice and clean, as well. They have natural oils in their fur, so they should only be bathed when it is absolutely necessary. Bathing them too often will dry out both their fur and their skin, which can lead to other issues. Rottweilers should also have their teeth and ears cleans once per week. They are known for having gum issues, so a weekly brushing will help their breath smell nice and keep them from having any type of pain in their mouths. Their ears should be cleaned with any solution recommended by a veterinarian. All in all, basic grooming is all it takes to keep a Rottweiler clean and healthy. Rottweilers have a lifespan of 10-12 years, with those who avoid health issues living a bit longer. They are prone to most common health problems, including cancer, allergies, and hip dysplasia. 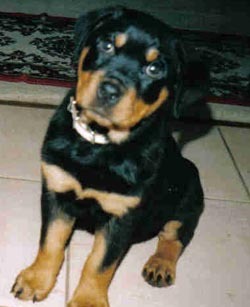 The most common health issue with Rottweilers is hip dysplasia. 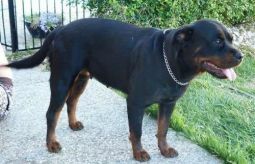 The reason for this is that there was a lot of over-breeding done with Rottweilers and bone issues are usually the first to come when that is done. Since they are prone to hip dysplasia, owners are told not to overfeed their pets proteins because this can easily lead to bone problems. Rottweilers are great for two types of owners: Those who have owned Rottweilers in the past, and people who have successfully trained other dogs in their lives. They aren't necessarily a tough dog to bring up, but they are a breed that needs special training methods to teach them what they can and cannot do. People who live in big homes with big backyards are also great for Rottweilers because they love to stretch their legs. They become uncomfortable in smaller spaces, so homes that give them multiple options to roam are great for this breed. Rottweilers also thrive when they have more than one person to connect with, so families of all sizes with adults and kids are great for them. They love the attention and the more people they feel like they are looking out for, the better. A lot of people want to own Rottweilers because of their looks and their personalities, but they aren't a great match for everyone. Even people who have the best intentions for this breed just wouldn't be a good match. For example, someone who has learned how to take care of a Rottweiler but lives in an apartment just wouldn't work out well. People who are looking for a dog solely to be a guard dog should also look for another breed. Unlike other great guard dogs, Rottweilers need to socialize and to exercise regularly, so while they would do a good job as a watch dog, they won't be happy animals. It's better for them to be full-time family dogs and part time guard dogs. This is a breed that people need to learn more about because it's a beautiful animal that can do amazing things when treated the right way. Rottweilers are absolutely fantastic pets when brought up the right way, so hopefully they are bred correctly in the future and only go to owners who know how to handle this type of dog.